On the 70th anniversary of D-Day, the Flying Longhorns paid tribute. Omaha Beach,” Frank Denius says. “That’s where I crawled up.” Holding court on the UT campus for a group of Flying Longhorns, some of whom have already traveled to France for the 70th anniversary of the Normandy invasion, Denius is taking a group of Texas Exes back to that harrowing day: the fear, the seasickness, and, of course, the physical extremes he and some 150,000 other men put their bodies through to get up that hill. American soldiers who stormed the beaches at Normandy regularly carried gear in excess of 100 pounds, including their rifles and ammunition. Denius, LLB ’49, Life Member, Distinguished Alumnus, then a 19-year-old private in the 30th Infantry, carried more than 150 pounds up Omaha Beach. A field of white crosses was set against the backdrop of the Atlantic, just below the cloudless sky. Denius was, in fact, just beginning his adult life when he shipped off for Europe in early 1944. Just weeks prior he was in a classroom on the UT campus, taking an intensive course to complete his sophomore English requirement. By the time he returned to the U.S., he had fought in five major WWII battles and taken over for a mortally wounded leader to help the army advance, resulting in one of Denius’ four Silver Stars and a promotion to corporal. For his actions, and for the actions of all American soldiers on D-Day, the people of Normandy and the surrounding regions are, to this day, incredibly thankful. So gracious, in fact, that when one traveler broke from the group to visit a sculpture at the top of the German memorial, a French woman, identifying him as an American, made her way over to him and hugged him tightly. Knowing nothing of his background other than his nationality she thanked him for liberating her country while grasping him in a tender embrace. From their home base of Honfleur, the group made many excursions across the region, highlighted by a stop at the wooden Church of Sainte-Catherine, one of the oldest churches in France. 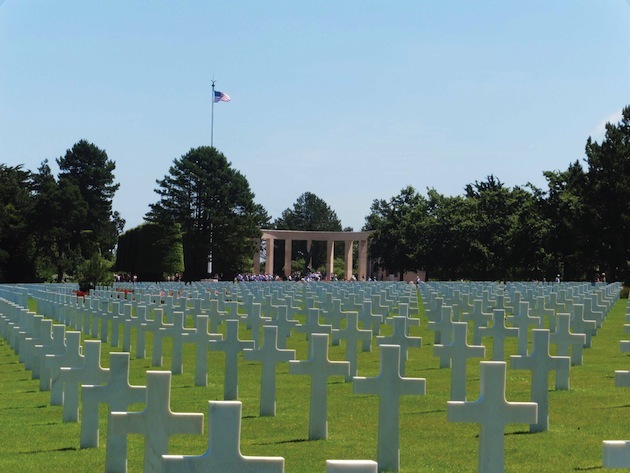 They also made their way to the distinct landing beaches and the American Military Cemetery, which, according to Gundersen, was “solemn but uplifting.” A field of white crosses was set against the backdrop of the Atlantic, just below the cloudless sky. An American flag flapped slowly in the breeze, the only noise audible to the travelers. “That was the most moving part of the trip,” Gundersen says. The German memorial in La Cambe is markedly different—obviously—than the Allied ones. Where the American graves are marked with white crosses that almost glistened in the sun, the German memorial features flat headstones and rows of short, black crosses made from volcanic ash, meant to denote a fallen soldier, but not much else. Apart from the solemn excursions to the beaches and memorials, the travelers immersed themselves in the art and architecture of the region. They visited the Wonder of the Western World, Mont-Saint-Michel, where the Flying Longhorns explored the granite island, its eighth-century church, and more. They also saw Monet’s gardens and the studios in Giverny where he painted his Water Lily series. On the way back to the hotel, they stopped for a tasting of the famous Normandy brandy Calvados. On the final night of the trip, the Flying Longhorns toasted to the veterans on the trip. They couldn’t help but feel a better appreciation not just for the soldiers at Normandy in June of 1944, but for all soldiers. It was the end to a trip that left an indelible mark on the travelers. Back on American soil, before Gundersen saw Omaha Beach with her own eyes, she asked Denius if he wanted to accompany them to Normandy. Who better to guide them than the man who experienced D-Day firsthand? Besides, Denius was recently in Normandy separate from the Flying Longhorns, when more than 3,000 people in the town of Mortaine, France recognized him and other members of the 30th last spring. The affection between the groups is reciprocal.